Actually titled "Guitar Vol. 4" the album is subtitled "The Great San Bernadino Birthday Party" and features the 19-minute song of the same name as the leadoff track. This is probably the most experimental release of Fahey's early years on Takoma, and gives a good indication where he would expand his sound in the years that followed. The title track is epic in every sense of the word, sounding like the soundtrack to an old west silent film that we've never seen. His guitar picking going between incredibly thought out raga's and moving to very simplistic modern classical sounding pieces, the song retains the romantic feeling of the city and area of California from long ago. From here, the rest of the record gets much more experimental. "Knott's Berry Farm Molly" employs the use of crazy tape loops that Fahey created with a standard mobile tape recorder. He tunes his guitar to an usual sound, starts picking and then suddenly starts using the backward loops, giving the track an entirely different feeling. The track goes back and forth between the two, and is a bit uneven, and not smooth in execution, but it pretty interesting regardless. His take on "Will The Circle be Unbroken" one of the more famous traditional folk songs sounds unlike any version of the song at the time. The recording sounds like it was done in an open room with really cheap equipment. A field recording in a graveyard almost. The track is dominated by an organ played by Flea (not RHCP), and though it is far out itself, the organ line is the only way to tell this is the song the title states. "Guitar Excursions into The Unknown" is wonderful. It's harsh, terribly tuned guitar, but glorious picking. It really sets up what is known as that whole "free folk" movement out of Finland that has been really popular in the last years. Again sounds like a field recording or on terribly warped tapes, it truly is a track that sounds like it is recorded for the "unknown"
on "900 Miles" we get a beautiful track, but one in which the guitar is not at the forefront. Again Fahey puts himself in the background, framing the track around Nancy McLean's flute playing. Other than the tile track, "Sail Away Ladies" is probably the best track on the entire collection. Featuring Al Wilson of Canned Heat on veena, the middle eastern feel to the track changes the course of old America, but is really beautiful on it's own merits. "O Come, Oh Come Emanuel" is another traditional and goes back to the old Fahey style. Clean guitar picking, a perfect way to close out the record. 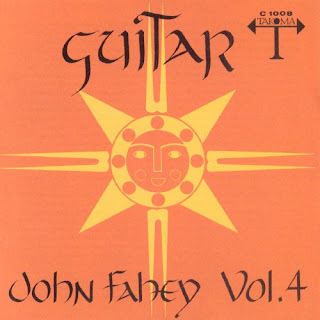 Fahey later went on to regard the record as one of the worst in his discography, but many critics of him, myself included, feel it belongs among his very best work. A retrospect on the genius that had been producing music for a decade and it also lays a blueprint for where he was about to go with his music.